Blog Writers vs. Print Writers: Are The Jobs Interchangeable? Switching professions is never easy, but people do it all the time. People often decide to take a different path because they don’t love what they are doing or because there is more opportunity in a different field. So it should be easy to change from writing for print newspapers and magazines to writing on the Internet, right? After all, these fields are at least related and very similar. In most cases, the answer is yes—a writer is a writer and although some modifications need to be made, it’s possible to make the switch. Many writers contemplate this question because internet content is becoming so important to many companies; thus creating tons of opportunity for writers. However, the question should not be whether a writer can do it, but whether they really want to. The first thing to understand is that sometimes print publications do have an Internet version. In the majority of cases, this writing will be extremely similar. However, writing for a blog is very different than writing for a publication. Keywords. When writing online a writer will usually have to worry about utilizing specific keywords. For print writers, this was never something that needed to be incorporated, and some feel that this takes away from the fun of writing. This falls under the search engine optimization (SEO) umbrella, which is something bloggers have to understand. Linking. Writers will also need to pay attention to links that he/she puts in an article (and there should be links). Again, a print writer might not be used to worrying about finding reputable links. This is also part of having SEO knowledge. Blog Style. The style of writing online is typically very different than writing for a publication. This is probably the biggest aspect that a writer should consider before leaving print for the Internet. 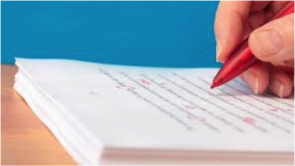 You will have to incorporate subheadings and bullet points, and in many cases you can insert your opinion. For those used to writing for a publication, this creativity is a bit different. Fewer Interviews. Publications often require a writer to interview industry leaders. Although this does occur in blog writing, most blog writing doesn’t involve interviews. This gives a print writer much less information to work with than they are familiar with, which some find to be a deal breaker. Hours. This is where print writers are often swayed to write for a company as a blogger. Bloggers usually have fairly flexible hours because there are no interviews to run to or publications to be sent out. In fact, many bloggers actually work from home. Although bloggers of course have deadlines, the hours are usually far less than reporters or magazine writers. The reason that this discussion is one many writers are currently contemplating is because Internet content is becoming so important. Print content is becoming less popular and blogs are on the rise, so the opportunities are following suit. Have you made the switch from print writer to blogger? Did you think this was the right decision, or was the job too different? Do you think a writer can love being a print writer and a blogger, or one or the other? Let us know in the comments below! Amanda DiSilvestro gives small business and entrepreneurs SEO advice ranging from keyword density to recovering from Panda and Penguin updates. She writes for HigherVisibility.com, a nationally recognized Search Engine Optimization Company that offers online marketing services to a wide range of companies across the country. Connect with Higher Visibility on Twitter to learn more! Interesting. I’ve done a little of both over the years, and I think they are complimentary. And I’ve like working for both. Print really helps you focus on the quality of the writing and integrity of the work. If you blog on a site for a regular basis, particularly regarding a specific topic or audience/community, you may find that you get the scoop on things much faster than you would otherwise, directly from key industry players (learned that at a very short stint at blackweb20.com). And you can feed pitches that require a lot more depth to long-format print mags. A narrow focus on keywords would definitely make blogging unattractractive for me (I also think it takes away from the quality of the writing). I’ve been fortunate enough to never have to blog for a site that focuses on keywords. The ones I have worked with really have focused more on engaging with the community, a separate skill entirely (but one the writer should also be compensated for, since it’s an additional responsibility). I’d disagree that linking has much to do with SEO knowlege, and probably more to do with how well you understand your audience and their interests. It’s not so much a quantifiable quality as it is a qualitative one, very much like community engagement. Don’t fully agree or disagree about blog style. Funny thing is, I think the brevity of blogging sometimes can make you a better writer. You have to capture the essence of what you are saying with fewer words. One example of great writing in a blog, I think, is getkempt.com, though I haven’t really read it much in a couple of years. Really thought their writing was always pretty good. It speaks to you. There are a lot of men’s fashion blogs out there, but it personally makes me feel like I’m listening to/chuckling with a person/voice and to instead of getting a hard sell: “buy this now!”. Demands of interviews generally have to do less with the platform and more a cross between pay, the expectations of the editor/publisher/owner of the blog, and the style/format the writer chooses. Sometimes editors and websites make it easier by 1) asking fewer questions (1-3), either in the form of an actual interview, or a recurring footer one question item like on thefiscaltimes.com or ebony.com. Some decide it’s more efficient to 2) e-mail questions to the interviewee instead (no need to reserve time or have transcriptions, but you have a much less natural and interesting dialogue, and sometimes there is the whole journalistic integrity thing, depending on who you work with/for, because it can end up sounding way to PR-ish. Or an editor or website can 3) pay the writer/blogger enough to outsource transcription, which keeps high quality and reduces time by a bunch, but costs more for the editor. Because of the cost structure of print vs. blogs, or websites that are more content/quality-oriented (eg, ig Interviews magazine was online only), you of course will see this far more often when working with magazines. But make no mistake, this has everything to do with pay structure and almost nothing to do with the format of the blog vs. print itself. The amount of information required depends on the subject matter, what you incorporate in the any introduction for example, and especially the TRANSCRIPTION of the material. If it’s a loooong interview, it’s going to take you a long time to listen to and type out every word. That is unless you are compensated enough to have that outsourced. It’s really interesting where things are going. In a perfect world, for me, whether blog or long format, I look forward to the day when the writing and the subject matter is what is most important. Though I know this doesn’t work everywhere, especially commercial work. But balance throughout this “ecosystem” would be a wonderful thing. I still like both, so long as there is an understanding between the writer and editor about expectations (format, timing, content, quality, payment, resources, business model, number of eyeballs, etc). To me that’s much more important than whether you consider your outlet a magazine, blog, e-zine, paradigm shift, what have you. Sheesh, I need a new picture. That’s old. I don’t even know how it automatically posted there.